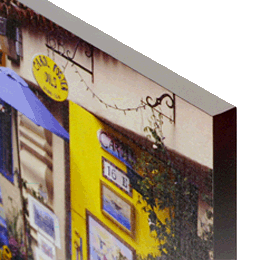 Complete your print finishing by having your artwork mounted by Digital Works onto a supporting substrate such as Foam-core. 5mm Foam-core is a very light substrate making possible the latest trend of glassless framing, where strong wall hanging devices are no longer necessary thereby allowing the advantage of being able to suspend your finished artwork with little more than the use of such wall hanging aids as “3M Command *™ ” removable picture hooks or even Velcro *™ pads. Without glass the problem of weight is not only reduced considerably but also the problem of broken glass, should the frame fall of the wall for instance, is prevented. Through our internet ordering software, you can now choose to have your images printed, mounted on 5mm foamcore, overlayed, and Custom Framed using Digital Works ™FrameBasics or have your images printed and finished on 5mm foamcore ready for you or your client to have custom framed. by selecting 5mm or 20mm Foamcore from the Category tab list within the program. **20mm foam-core (pictured above) is an ideal print substrate. Due to its thickness 20mm foam-core imparts a solid look and feel, transforming your prints into a unique finished artwork your clients will be proud to display. The edge is complemented with your choice of a black, white or brushed silver edge trim, wall hanger, and overlayed with a texture film overlay such as “ *™ ArtShield Special Texture lustre” your printed image will become a low cost, attractive, robust, highly scuff resistant, ready to hang artwork without the need for costly additional framing and matting. Why Choose Digital Works for Print Mounting? The foamcore substrate surface is prepared at Digital Works with a high tack layer of adhesive, an interlayer of polyester to help even out the subsrate to produce the flattest, smoothest surface possible and then a final high tack adhesive on which the print is mounted. The tack of our adhesive is so strong that to remove the print from the foamcore requires the destruction of both the material and print. That is to say it is a permanent process. Like wise should you choose overlaying, prints are permanently bonded to the overlay using heat and pressure to produce the highest possible transparency, clarity, enhancement, and protection. We choose only the highest quality professional materials throughout the whole of the process. We do not print directly onto the foamcore substrate. We do not spray prints with lacquer and call this laminating. We will not compromise our reputation for price.